Published May 13, 2015 by Prentice Hall. Part of the LiveLessons series. Billions of apps have been downloaded from Apple’s App Store! 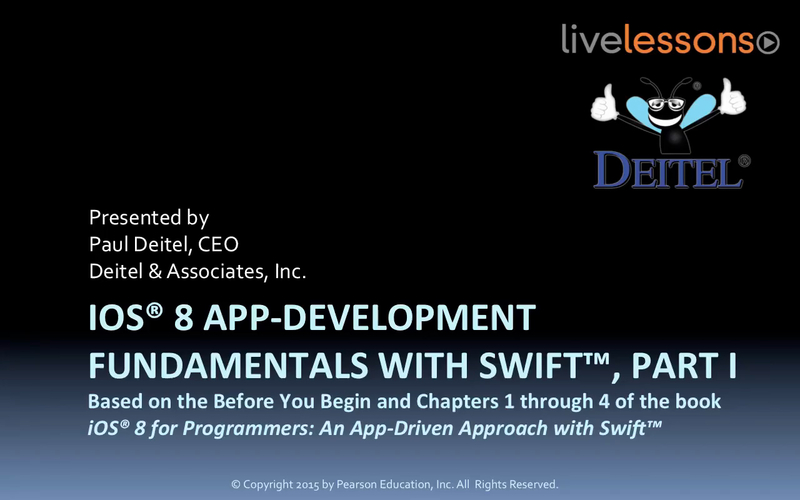 This LiveLesson gives you everything you’ll need to start developing great iOS 8 apps quickly using Swift–Apple’s programming language of the future. The video uses an app-driven approach–each new technology is discussed in the context of seven fully tested iOS 8 apps (three apps in Part I and four apps in Part II). IMPORTANT NOTE ABOUT XCODE AND SWIFT: With Xcode 6.3 and Swift 1.2, Apple introduced several changes in Swift that affect the book's source code. Please visit www.deitel.com/books/iOS8FP1 (the website for the book on which these videos are based) for updated source code. The changes do not affect Xcode 6.2 users. You can download Xcode 6.2 from developer.apple.com/downloads/index.action (you’ll have to log in with your Apple developer account to see the list of downloads).